Pool swimming has its own marathon! Never swim 200 laps of the same lane again! Enter Marathon Swims and you will complete a course - 10 lanes, 10 times, 10,000 meters - not endless laps of the same lane. After each 1km you can interact with your loyal supporters, take on fluids/fuel and even pose for a mid-race selfie (if you're not worried about your time). Individual chip timing provides instant, reliable results, your 1k splits and a finish time. Set within the awe inspiring venue of the London Aquatics Centre. 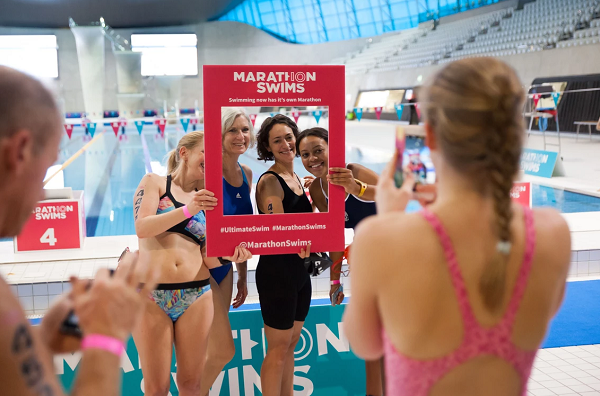 Level Water is the 2019 official charity partner of Marathon Swims London and we would like to offer you a 50% discount on entry in return for fundraising for our amazing work. We teach disabled children to swim, with your help we can teach even more children! Marathon Swims London SOLD OUT in 2017 and 2018, so claim your place in this unique swimming challenge, today. ENTER now for £41 and swim 10k with Level Water! The pool is divided into 10 lanes. Marathon Swimmers start in Lane 1 and swim up and back down the lane. On returning to the starting end, Marathon Swimmers move into Lane 2 to swim up and back, repeating this until reaching the end of Lane 10 and completing a set (1km). Having swum up and down each of the 10 lanes, exit the pool, travel along the side (saying hi to your supporters on the way, maybe grabbing some fuel and checking where you are on the leaderboard) to start your next kilometre. The event is way more exciting than a continuous pool or open water swim - you're moving across the pool every 50m, getting out of the water to cheering and poolside support every kilometer. As soon as you cross the finish line, your timing chip will instantly send you your finish time. You can track your 1k split times over the course of the challenge and see the length of time spent out of the pool in transition (between each kilometre). When is this awesome challenge? Saturday 9th and Sunday 10th November 2019 at the incredible venue for the London 2012 Olympic and Paralympic Games – the London Aquatics Centre, Queen Elizabeth Olympic Park. Take on the Marathon 10k Challenge today! Level Water is a charity that teaches disabled children to swim through one-to-one lessons. Without one-to-one lessons, most children with disabilities would not learn this life saving skill. Along with reserving your spot in the swim, you will get training kit (sports bottle, technical t-shirt and swimming hat), and our energetic support as we cheer you on at the event! We kindly ask that you do as well as you can to raise £200 of sponsorship – support from people like you makes an enormous difference to the number of disabled children we can teach across the UK. Give the gift of sport and help us teach more children how to swim. ENTER now and secure your half-price place below! A Marathon Swim is a very long distance and breaks are encouraged. You will have access to your fuel and fluids on the poolside and even your mobile phone if you wish, so you can keep your supporters, sponsors and friends updated on your progress mid-swim. You can rest out of the water as long as you want, however the time will be included in your overall completion time. We recommend you only rest out of the water. You may wait at the end to allow a faster swimmer behind you to pass easily. The pool is divided into 10 lanes. Marathon Swimmers start in Lane 1 and swim up and back the lane. On returning to the starting end, Marathon Swimmers move up to Lane 2 to swim up and back, repeating this until reaching the end of Lane 10 and completing a set (1km). Having swum up and down each of the 10 lanes, exit the pool, travel along the side to start your next kilometre. Overtaking is very much part of the event. There is two-way lane traffic in each of the lanes, so the overtaking swimmer needs to ensure it is safe to proceed with the manoeuvre and overtake on the left hand side. Lane swimming etiquette also applies, as if you have your feet touched by the swimmer behind, it is kind to allow them past you on the next turn (unless you are held up yourself or think that you can swim faster on the next lap). Tumble turns are permitted. It is the responsibility of each swimmer to ensure turning and overtaking manoeuvres are appropriate and safe depending on the swimmer load in the lane at the time. ENTER now and swim for half-price with Level Water!